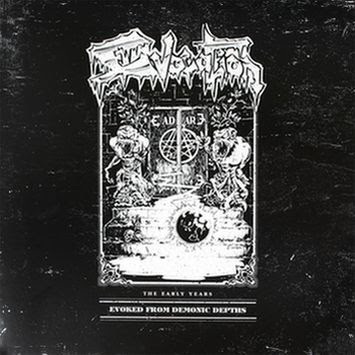 After taking a break from listening to Swedish death metal, due to the sheer ridiculous amount of bands that I’ve heard in this style over the last year or so, I decided to pick up Evocation’s recently released compilation a few days ago when I happened across it in a local store. This release compiles Evocation’s two demo tapes from 1992, an unreleased rehearsal recording and a previously unrecorded track from ’92 entitled “Genesis”. Evocation definitely have always had the “Swedish sound” akin to Dismember, Grave, Entombed and so on, but, they always stood apart from the pack in the way that they incorporated melodic influences that have more in common with the Gothenburg scene than the Sunlight studios crowd, leaving us with a more unique and accessible take on the old-school Swedish death metal sound. I’m not sure how this was managed way back in ’91, but, Evocation got a really high quality sound on “The Ancient Gate” and the “Promo 1992” demos. When combined together on a release like this (or their previously released self-titled compilation from 2004), the two demos flow really well together, and if the band hadn’t broken up not long after, I think they could have released an absolute belter of an album that would be up there with legendary releases like “Left Hand Path” and “Like an Ever Flowing Stream”. Sadly, the previously unreleased rehearsal demo sort of feels like it was just tacked on the end as a sort of afterthought, with a real raw and sloppy recording job that sounds completely different to the other two demos. However, the versions of the songs on this part still sound good in their own way and give a different insight to songs that you’ve already heard earlier on the comp. “Genesis” would fit in perfectly well with the two demos and it’s great that the band finally recorded it as a bonus track for the compilation. All in all, this compilation is a killer package, with all of their early demo material (almost an hour worth of music) and a 32 page (!!!) booklet containing background info on the band, all lyrics, a bit of info about each song, liner notes, three live bootleg video enhancements on the CD version, information on the story behind each recording and a lot of photos, any fanatic of the old Swedish underground would be a fool to let this pass them by.